Happy Halloween!! 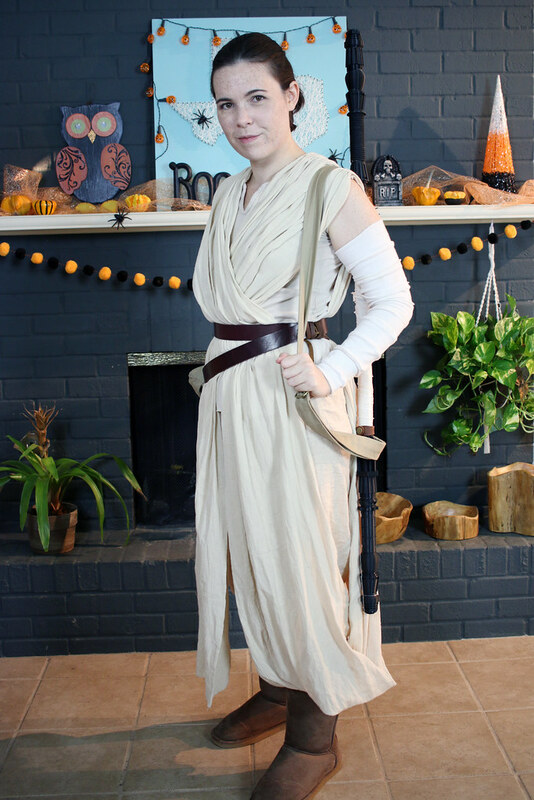 This year I stayed home to hand out candy to trick-or-treaters (and maybe eat all some of the candy myself) but I wore my new Rey costume from Star Wars: The Force Awakens. This cosplay isn’t screen accurate – for one, the color was hard to get right. In some stills from the film, Rey’s outfit looks more gray than beige. And obviously many of my details aren’t the same as the movie’s (like the boots) but it’s good enough for wearing to a convention or Halloween party. I started by adapting the bodice pieces of a t-shirt pattern and extended the shoulder line to create simple “cap” sleeves. I bound the neckline with the same cotton rib knit as the shirt and tea dyed the whole thing with some English breakfast. Rey’s pants in the movie are made from raw silk. Mine are a tea dyed linen/cotton blend. I lengthened the leg pieces on a generic, elastic-waist PJ shorts pattern and added cuffs on the legs. If you’ve ever been to Joann Fabrics you’ve probably seen this textured cotton gauze. I bought like, 7 yards of it in beige, split it lengthwise down the middle, and gathered it at the shoulders. The texture of the fabric naturally makes it look gathered at the waist and the belt holds it in place. The belt is a long, plain belt base from Tandy Leather wrapped twice and tied on one side. I used strips of leather scraps from a “scrap bag” (also from Tandy) to hide where the belt ends meet. I didn’t have a leather piece long enough to make the wrist band so I had to stitch leather scraps together in sections. This isn’t actually the way the wrist band is supposed to wrap around my arm but I must have cut it too small to fit with the arm wraps underneath. I basically reversed engineered the thing based on photos but this McCall’s pattern does the same thing. Too bad that pattern was released after I made most of my costume. The bag was self drafted based on images of Rey’s bag. It’s made from cotton duck, nylon “belting”, and some rectangle rings. After wearing it to the Con I decided to add velcro to keep the top from flapping open. Just some brown fake Ugg boots. If you want the real deal – Rey’s boots in the movie are made by PoZu. These were the most difficult thing to get right. At first, I used tea dyed muslin strips about 3in wide wrapped around my arm and tied a the wrist and bicep. But those things wouldn’t stay up and they’d spread apart at the elbow. I was constantly adjusting them. This was the big prop of the outfit. It consists of 3D printed pieces slipped onto a wooden dowel rod, wrapped in black paracord and tea dyed muslin scraps. The strap uses some cotton twill with bronze clips connected to a little bit of leather scrap with bronze snaps. My staff is only 4 ft long while the movie version is about 6. This is on purpose; I didn’t want to be accidentally whacking anyone with a stick as I walked around a convention floor. I’ve gotten plenty of wear out of this costume so far. I wore it to Austin’s ComicCon in September and I wore it to three Halloween events as well. If you wanted to do this project the easy way – use McCall’s 7421 for the pants, shirt, wrist band, belt and arm wraps. And just use a really long piece of cotton gauze for the body wrap with gathered shoulders (this pattern’s version isn’t the same as in the movie). If you want to know any more details about the costume feel free to leave a comment! This whole costume turned out much better than I anticipated so be ready for an abundance of photos in this post. If you want to see more pics, check out my Flickr album. I also promise to keep this post as spoiler free as possible. So, why Game of Thrones? Why Margaery? Well, the costumes on that show are fantastic. And GoT has no shortage of fabulous lady characters of all types but I like Margaery’s character for several reasons. As a young queen she’s clever and ambitious. Tenacious, self-serving but at times truly kind. She’s loyal to her family but is always looking out for #1. She knows how to play the game and she does it with flair. And she is played superbly by the lovely Natalie Dormer whom I first watched on The Tudors many years ago (her signature smirk is difficult to mimic, I tried my best). But in the end, I thought I could figure out how to design one of her iconic costumes without needing to use a pattern. Let’s talk about the dress. After assessing pictures of the real costume, I used the highly accurate method of “Let’s See if This Works” to design my version. I did a combo of flat pattern manipulation, draping, and excessive pinning until I got a bodice shape that worked. From the production stills, it looks like a wrap front gown with skirt gores. So I designed a cross-over front with hooks and eyes for closure. As for the skirt, I measured my waist, divided it by six, added seam allowances and cut 7 gores (one for overlapping in the front) that widened at the hem. I lined the skirt and the bodice with white muslin. The shoulder bits wrap over from front and attach at the back sides. There’s actually a trapezoidal shaped piece under the neck connecting the two shoulder pieces in the real version but for mine, I decided to simply make the shoulder parts wider to meet in the middle. The main bodice fabric is some poly brocade from Joann, a lucky find as I struggled for months to find a suitable design with the correct colors. The only problem – it frays and snags easily. The shoulders are a stretch velvet, also from Joann, stiffened with some deco-bond-like Pellon interfacing for handbags, and are attached by hand tack stitches in a few spots along the bodice. The skirt used voile from Fabric Wholesale Direct. It was cheap, wide, and the perfect color. I lined the skirt and the bodice with white muslin. What to do with my hair kept me from taking photos for so long. I hate wigs, usually, but I had to admit, my natural hair wasn’t going to cut it. So I bought Arda Wigs’ Grace Classic in Light Brown. I still don’t enjoy having an itchy, sweaty scalp but for less than $40 it was the perfect hair for this costume and I’m glad used it. Finally, the belt. Margaery hails from Highgarden so flowers play a major part in her costume motif. Her house motto is “Growing Strong.” I purchased my resin rose belt from this Etsy seller (highly recommended, but it looks like she’s no longer making it. You could always send her a message and ask). The belt is attached with skinny ties on either side sewn into the waist seam. I’ll try wearing this cosplay to the local Comic Con in the fall. I had better wear it while I can, the final season of the show comes out next year! Despite the lack of posts I have been rather busy with sewing projects this last month. 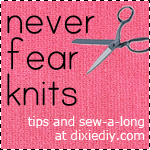 Since none of these are true clothing items, I’m going to lump three smaller projects into one big post! I’ve been cleaning my sewing room and stash busting like crazy lately. Deep in a drawer sat a bag of pre-cut fabric strips which were intended to become a quilt two years ago. Originally I know I had a pattern for the strips but at this point who knows where that pattern is. I simply sewed the strips together and chopped them up into smaller bits until I had a roughly-crib-size quilt. The back I made by piecing together leftover strips and some other fabric hiding in my quilting cotton drawer. I made bias binding out of scraps. The only reason I quilted this thing at home myself is because it’s so small and I only did straight lines following the seams. Easy peasy, or as easy as making a quilt can really be. I made this bag as a sample for a class I’m teaching at Me & Ewe but I’m surprised how much I like this pattern. It’s called the Two-Hour Tulip Bag from Anything But Boring. I made the largest size. It’s interlined with cotton batting but next time I think I want to use some stiffer interfacing and maybe make a firm square removable base, otherwise the bottom doesn’t keep it’s shape when you load up the bag. It really is a quick make and it has plenty of pocket options. The bottom of the bag comes together in a neat way to make a point in the center. SXSW is a massive event in Austin that seems to take up the entire month of march. I usually avoid the chaos all over town but I do make the effort to attend the free Game Expo. It’s like a mini game convention in the middle of a much bigger festival/convention/traffic nightmare. This year, only about a week before the event, I decided to throw together a costume. This is Piper, a journalist and wasteland survivor from the post-apacalyptic video game Fallout 4. My number one requirement for costumes is that I don’t have to wear a wig. Check! It was seriously last minute. Most of the costume pieces were bought off Amazon prime (yay 2-day free shipping!) and then altered. I attached the faux suede to the collar and cuffs of the coat and quickly sewed some flannel together for the scarf. This was only my second real cosplay but I’d say it was pretty successful. Not only did a lot of people recognize me but the whole costume was quick and cheap to put together. Win! ***BTW, in case you’ve missed me, I’ve been posting a bunch of other small projects I’ve been working on over on Instagram if you want to follow along. Hey readers, it’s been a few weeks since I’ve posted but I feel like I have a good excuse – I’ve been focusing on some costume work and getting ready for PAX South, a gaming convention in San Antonio. Now I’m back home and relaxing from a busy weekend. And I can finally show you my completed Elizabeth Cosplay! If you want to see a bit of Liz in action you can watch this trailer on youtube. However, it’s definitely a violent game so keep that in mind before you click. PAX was my first convention so I was nervous at first but once I saw plenty of other cosplayers running around I felt more confident about being dressed up in a silly costume. I only wore it for a few hours – my boots weren’t very comfy and Justin tied my corset a little too tight, oops. I got lots of compliments and quite a few photo requests. I usually went with my standard “fiddle with the pinky thimble” pose. This character doesn’t have any weapons so there’s not exactly a cool action pose I can do. I only saw one other Elizabeth there which was surprising because I figured she’d be pretty popular. Necklace: a length of satin-y ribbon with clasps at the back (which I realize now should have been tighter). The bird brooch came from this etsy shop and I was surprised by how nice it looked considering how inexpensive it was. It’s pinned to the ribbon but the weight drags it down. Jacket: I added the collar and hemmed it… with stitch witchery. ‘Cause lazy. Also, the shiny material shows stitches, even when trying to make a blind hem. The stitch witchery was just easier and gave it a clean finish. Skirt: At the last minute I added a pocket in one of the side seams which helped out so much with carrying cards and phone and whatnot. Pockets FTW! Petticoat: Actually, this is a huge petticoat that I originally made to go over a Civil War era hoop. The petticoat is probably too big for the skirt, to be honest. For the hem hem I attached a 1 foot wide box pleated strip of fabric which gives the hem a nice kick but took it FOREVER to press and sew. It also got pretty dirty from walking around. 🙁 Oh, well. It’s white which is easy to clean. Shoes: Bought some “victorian-esque” style boots from Amazon. They have a zipper on the insides which is kind of cheating but that’s ok. They did they job but certainly weren’t that comfortable. And my thimble is on the right finger! In the game Elizabeth is missing part of her pinky which she covers up with a thimble. I’m actually really proud of myself. I’m not usually one to dress up at events like this and I tend to shy away from attention in general but I went out of my comfort zone and I think I did a pretty darn good job of recreating the character.